When it comes time to choosing a new floor for your home setting, hardwood flooring certainly seems to stand out from the other options. Hardwood simply has a natural character that cannot be replicated. As a result, hardwood flooring, as long as it’s treated correctly, can add long-lasting style, luxury, and even value to your home. Johnson Carpet One Floor & Home in Grandville is your local source for hardwood flooring, and we can help you find your next new floor. Hardwood flooring is an investment in your home, so you want to make sure you not only choose the right kind of hardwood floor, but that you also take into account if hardwood is right for your home. Hardwood is available in a variety of options like different species, colors, plank sizes and more. You have the ability to choose from finished and unfinished hardwood floors, which means you can either have the installer apply a finish in your home or purchase the floor pre-finished. Another important choice is if you want solid or engineered hardwood. Is Solid or Engineered Hardwood Better? Hardwood is available in two different types: solid and engineered. Solid hardwood, which is the more traditional option, has a rather uniform construction, as it is made from genuine strips of wood and nothing else. There is no special construction. Solid hardwood planks are therefore thick enough to handle multiple refinishing’s. Nowadays, most homeowners opt for engineered hardwood flooring because, unlike solid hardwood, it features a layered construction. With this construction, engineered hardwood is more dimensionally stable than solid hardwood. It can be installed below, on, or above ground, and the planks can handle some moisture and humidity without swelling. Engineered hardwood offers greater stability and support, but it is recommended that you install hardwood in residential areas with low to moderate foot traffic and little moisture. And, after installation, hardwood needs to be properly maintained. The best spaces in your home for hardwood include bedrooms, living rooms, and dining rooms. If you choose a more durable hardwood option however, you can install it in hallways, on stairs, and in a finished basement. Johnson Carpet One Floor & Home in Grandville, MI is your local hardwood flooring expert. We offer a large selection of hardwood options, including Carpet One exclusive styles from Invincible and Rustic River. Plus, we have specialty brands such as Casabella, Armstrong, and Shaw. In addition, we provide quality design services to make sure that your new hardwood floor will fit exactly into your home setting. Our designers will work with you to choose the right style and finish, so your new floor will certainly look beautiful in your home. We can help you design your floors around your home or your home around your floors. Whichever you need we have the experts to help. Hardwood is relatively easy to maintain, but does require to be looked after diligently. Follow the link below for tips of how to keep your hardwood floors clean. 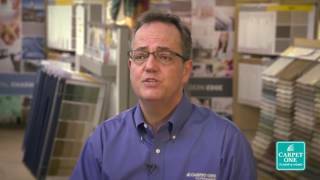 Learn about how we test moisture in rooms before hardwood flooring installations. Let our hardwood experts help you handle hardwood floor installation.